Helps fight oxidative stress and its effects on aging. Our dietary supplement is formulated from astaxanthin, a natural pigment present in several living species. It is, for example, found in salmon, flamingos and certain shellfish, where it is responsible for their pink or red colour. Astaxanthin sources include yeast, and algae such as Haematococcus pluvialis, the source used in our new supplement. The reason this natural pigment is now being offered in supplement form is that it offers significant antioxidant potency. exert a preventive effect against cancer. 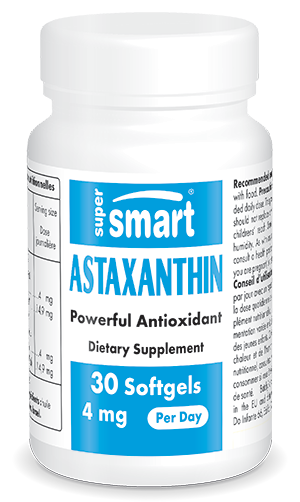 While astaxanthin is the main constituent in our supplement, it is not its only active principle. Enriched with the antioxidant vitamins C and E, this formulation actually offers a concentrate of natural antioxidants. While vitamin C is widely-known as a powerful antioxidant, the beneficial properties of vitamin E are perhaps less familiar. Yet, like vitamin C, it is an essential vitamin for the body and offers considerable antioxidant power - hence the addition of these two nutrients to our formulation. Vitamin E is included in the form of alpha-tocopherol, the most nutritionally important form of vitamin E for human health. This optimal, natural, antioxidant formulation thus protects the body from the harmful effects of oxidative stress, cellular ageing and external aggressors. Available from the SuperSmart catalogue, this new formulation is a potent, natural, antioxidant concentrate. It is formulated from an extract of Haematococcus pluvialis, a form of algae which contains one of the highest concentrations of astaxanthin, resulting in a high-quality product standardised to 5% astaxanthin. In addition, this supplement comes in the form of softgels for better absorption. To benefit from its powerful antioxidant effects, the recommended dose is one capsule a day, to be taken with meals. You may also be interested in Carottol, a complex of natural carotenoids including beta-carotene, lycopene and astaxanthin. Other ingredients: Glyceryl mono and di-stearate, silicon dioxide, soy lecithin. Each softgel contains 40 mg of Haematococcus pluvialis algae extract, standardised to provide 10% (4 mg) astaxanthin. Warning : contains soy lecithin. Take one softgel a day with food or as advised by your therapist.